Let’s dig into this notion to see what can be uncovered. Stick around and share your thoughts afterwards. 1. It’s actually impossible to FULLY live for others, even those you love the most. Imagine yourself as a flower planted in the wrong soil, in the wrong climate, roots drinking up the wrong minerals and petals not receiving the right stuff from above. Longing to grow as much or more as the other native flowers. Willing to work just as hard at aiming for the sun, or leaning into the shade. Willing to fit in and be a good soldier flower. Here’s the sad part: you might even succeed at shaping yourself into the required form. From the outside you look fabulous. I can’t speak for the inner life of plants, but I have close to half a century of experience tending my own human garden and looking over the fence to watch others tend theirs. 2. We can outwardly bloom with the best of ’em, while wilting and fading on the inside. In the wrong soil or under the wrong sky, wilting and fading might be less tragic than “making it.” You know? Those wilting feelings and fading colors are signals prompting us to DO SOMETHING to make it right for ourselves. 3. Most plants aren’t blessed with legs and other means of changing their world. 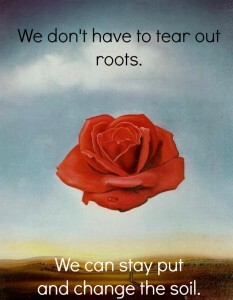 But we can get real, pull up our roots and move on to where we belong. A place that feeds us. This is not just about location. 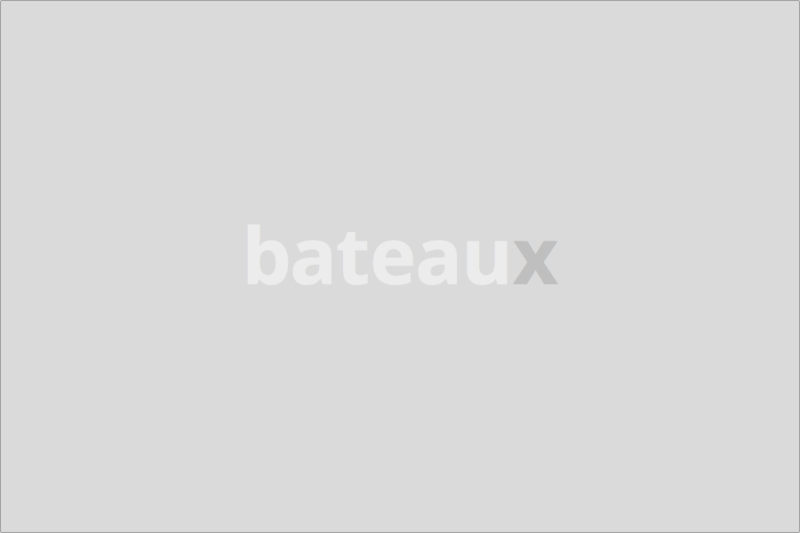 Habits, world views, jobs, credit card companies, significant others, collaborators…. the living room sofa. 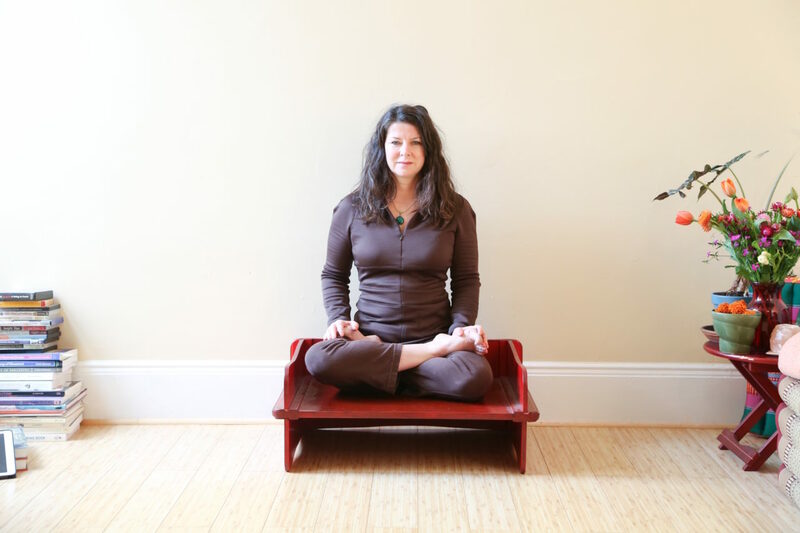 Maybe you’re a yoga teacher who feels out of alignment with the way your studio owner does business…. I live in a concrete jungle. My walk to class is all about watching my back and averting my eyes. Yet, joy is everywhere, in every form imaginable. My city friends think of me as a tree hugger. I am, I still climb trees, even. I just don’t live near any. I love to visit Shangri-La, but there’s no work for me there. 4. When we act to change our circumstances against the status-quo, some call us rebels. (Or worse, unprintable names, not always to our face) I’m not into “Rebel” as a word. Rebel-ways don’t feel like rebellion to so-called rebels. They’re just people trying to get it right in life — rather than just living out wrongness because changing would be hard and scary. The true rebel’s inner compass points in the direction that’s real for them – not necessarily the easiest, coolest or most lucrative one. They like an easy, cool payoff now and then, but not when it’s a carrot-on-a-stick. And depression – as far as my own – when I feel it setting in, I think of the wilting, fading, flower. That wilting is a signal, not a curse. 5. We don’t have to pull up roots. We can stay put and change the soil. With the right nourishment, we’re better participants in the community ecosystem. Neighboring flowers might need the same change. 6. 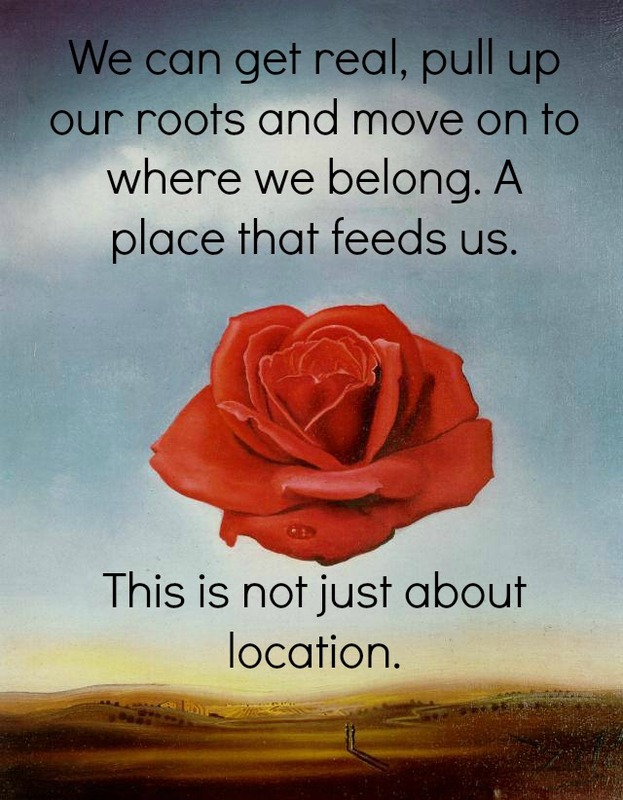 Or maybe we’re feeling the tug of others pulling us out of a soil that’s really feeding us? Root down. Root down fiercely, savor the flavor of that good soil. The nutrients build strength, and so does the loving of them. 7. We still sometimes get uprooted despite our best attempts to create the life we love. But at least we’ve done our damnedest. Failure counts. 8. Ask others for guidance on how to stay put.….but also, please, feed the inner guide. The more rooting into the right soil, the stronger that inner guide will get. People notice this fulfillment. Even strangers sense something positive as we say hello on the street. 9. And what about that poor, Tenacious Rose who manages to achieve the form of success despite the wrong soil and climate? As far as I now, nobody has cracked this code – in the botanical world or the human one. But I offer this > The Tenacious Rose, stubborn enough to grin and bear it in the wrong conditions, yet not courageous enough – or without the circumstances – to change their situation…. 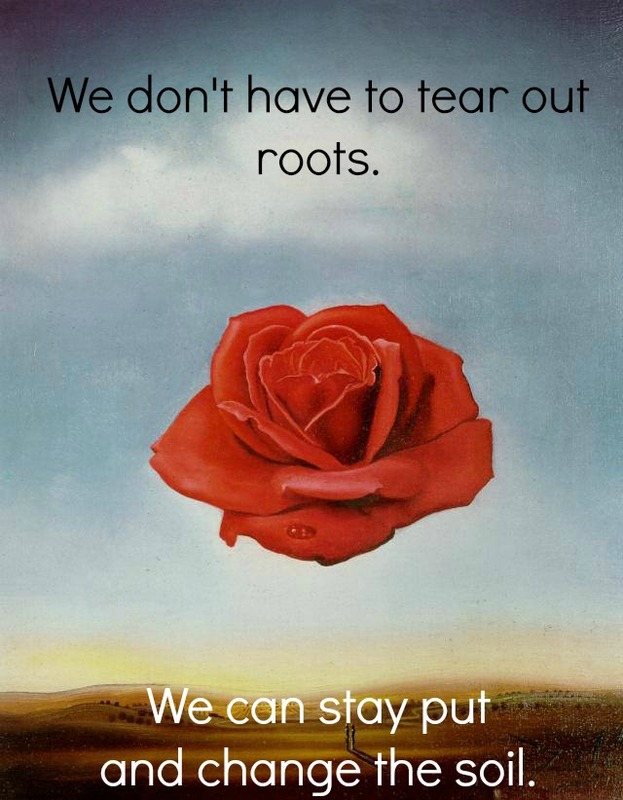 I like the image of the Floating Rose by Salvador Dali. In it, I see the blossoming & buoyant heart. Imagination & Willpower <> Something from Seemingly Nothing. An inner bloom, the kindest courage, compassion with thorns, the most trustworthy offering, the true beauty. My kind of Tenacious Rose. What about you? Did you relate to this post? How do you know when your not getting the right stuff? 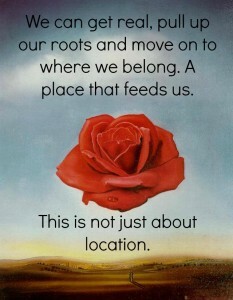 I wanna hear your stories of you rooting down in what was right, or uprooting and changing despite being afraid, or staying put and upgrading the garden. I love these kinds of stories. And if you read this far down the page, chances are, you’ve got a few. Previous How do You Roll from Here? Tova, you helped me write this post in all our Skype meetings when I'd start talking passionately for no good reason and you'd be like, OMG I can't believe what you're saying…You gotta make this a blogpost. Now when I find myself talking that way, or writing a blazing comment on Facebook, I pause and think about blogposts. It's becoming a habit. Terra, I had to get the yoga ghetto in a post! I was fine with working it in. But hey, it slid right in place. ANd I'm so glad that you think there's wisdom in there…. I look forward to what's next in your posts, in all our overlapping paths. Oh, Dani what a sweet thing to say. Thank you for inspiring me to write this post. You opened up the field by sharing your experience. My 1st draft was basically just a paste-in of my comment on your post.